I finished Hamlet, a classic by Shakespeare as well as an interesting and slightly strange story. This story stars Hamlet, a son to a king who recently passed away deals with his ghost. Hamlet’s father’s ghost reveals to being poisoned by his brother, and makes Hamlet promise to kill his brother. Hamlet, under immense pressure, vows to avenge his father. While also feeling betrayed by his mother, the queen who marrys the deceased kings brother, Hamlet struggles with trust. In the end Hamlet does succeed in killing his once uncle now father/king. This play was interesting to read- challenging but intriguing. There was great mystery within this story- the ghost of the king Hamlet, was he real? Or was Hamlet simply imagining his father? The writing of Shakespeare is simply incredible- the wording, grammar, provides the flow of the story while keeping the plot under control even with the insane things taking place. I would not say this was my favorite piece by Shakespeare but I do recommend it. This entry was posted in Read This!, Teen Powered and tagged classics, ghosts, mysteries, shakespeare, Teen Book Reviews, written by teens on January 28, 2015 by Teen Blogger. Editor’s Note: Camilla, a 19-year-old intern at 826 Seattle, has selected some excellent work that 826 students are producing this summer to share with us on Push To Talk. This is the second installment in that series. 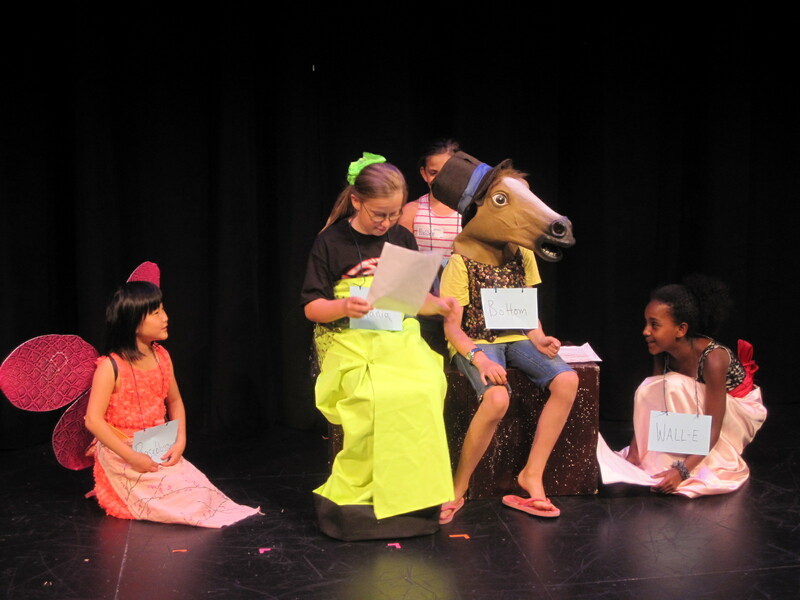 Camilla’s Note: Shakespeare can be really inaccessible to younger students, especially when it’s taught rigidly. This hilarious modern language “translation” of a scene from A Midsummer Night’s Dream, which was performed alongside the original text, demonstrates an astute understanding of the material as well as a great deal of creative gusto. (Here’s the original for comparison). TITANIA: What dude wakes me from my wonderful bed? TITANIA: I beg you, peaceful dude, keep on singing! I’m totally digging your high-pitched screeching and my eyes love you; you look very dude-like. You are such a beautiful dude, you make me shout out loud I LOVE YOU! BOTTOM: Oh, my gosh, you actually like me? Truth, reason, and love never hang out so I guess it makes sense that you love me. TITANIA: Your dudeness balances with your smartness. TITANIA: Don’t go! Dude, stay here, you’re going to enjoy it here ’cause I’m here—duh! You don’t wanna miss this. Also if you leave you might die, and I love you. So the point is, stay. Dude, I got fairies; dude, I got jewels from underground; and dude you can EVEN sleep on flowers while the fairies sing to you! I’ll take away your human self and you will be a forever living, floaty fairy dude. Peaseblossom! Walle! Greg! Get over here! GREG: And I…need to take a shower. ALL: What are we gonna do?! TITANIA: Be kind and nice to this dude. Jump in his path and boogie before his eyes. Feed him chips and fries. Say hey to this dude! This entry was posted in Teen Powered, Theater, Who knows?, Writing and tagged 826 Seattle, shakespeare, Theater, theatre, Writing on July 23, 2014 by Teen Blogger. In my Language Arts class we completed a unit on William Shakespeare’s Romeo and Juliet and The Tempest. I love Shakespeare and I was very excited for this unit, but I was surprised to learn that not many of my peers felt the same way. At the beginning of the unit we divided into groups of people who felt they understood Shakespeare and those who didn’t. The larger of the two was the latter and that was very evident for the rest of the study of Shakespeare’s work. As we read the plays I heard many of my peers say things like, “I couldn’t understand the section, I just looked it up on Sparknotes,” “I can’t read this with all the confusing vocabulary,” “I wish we could just watch the movie,” and “What is it even talking about?” Since I have always had a love of Shakespeare, it hadn’t occurred to me before this unit that others don’t appreciate his work the way I do. Most of the vocabulary is not too difficult for me but I learned that not everyone has the same opinions. As a conclusion to the unit, we had a class discussion regarding whether or not high school students should read and study Shakespeare’s work. At the beginning of the unit I would have said, “Yes, absolutely, it is marvelous literature that everyone should read.” Unfortunately, after the unit my answer has changed. I now have to say that in my opinion, high school students, at least sophomores and freshman, should not being studying Shakespeare’s work yet. In the later high school years and in college it might be more appropriate to read in schools. I believe that if students cannot understand the beautiful language and cannot properly read the literature then there is no point in studying it. If you are a Shakespeare lover you can check out the library’s extensive collection of Shakespeare’s work here. If you are not yet a Shakespeare lover, I hope someday you can read and appreciate his work. This entry was posted in Author, Opinions, Teen Powered and tagged high school, shakespeare, written by teens on July 6, 2013 by Teen Blogger. Shakespeare. Oh Shakespeare, a name that strikes fear into many students like me, yet excitement to others (especially teachers). Out of Shakespeare’s many tragedies and comedies, one of his best known is Romeo and Juliet; “a classic” so I have been told. After bearing through months of sonnets, and decrypting the story, I came to enjoy the story of star-crossed lovers, tearing up a bit as the end was reached. Despite its roots in the ancient Shakespearean times (oh too long ago), Romeo and Juliet has impacted our modern day teenage lives. This entry was posted in Author, Opinions, Read This!, Teen Powered and tagged classics, romance, shakespeare, Teen Book Reviews, written by teens on June 14, 2012 by Teen Blogger. Outdoor theatre is the perfect summer entertainment; imagine sitting in the sun, having a picnic with family or friends, watching a play on the lawn just a few feet away—and it didn’t cost you a dime! What could be better? This entry was posted in Events, Free Stuff, Seattle, Teen Powered, Theater and tagged Free Stuff, shakespeare, Summer fun, Theater, theatre, written by teens on July 7, 2011 by Teen Blogger. When two high-class English wives are left alone together, how much mischief can they manage to get themselves into? Mistress Ford and Mistress Page discover several sources of entertainment in the Seattle Shakespeare Company’s production of The Merry Wives of Windsor. Filled with light-hearted trickery, clever acting, and stunning visual effects, this theater production embodies the true spirit of a Shakespearean comedy. While William Shakespeare is most widely recognized for his tragedies such as Romeo and Juliet and Hamlet, his comedies are equally memorable and entertaining. The recurring character of Sir John Falstaff, a plump old knight determined to acquire money, has earned the title of the most beloved Shakespearean character in terms of comedic value. Falstaff once again becomes the object of hilarity in The Merry Wives of Windsor when he decides to simultaneously woo both Mistress Page and Mistress Ford, two wealthy, married women that supposedly take charge of their husbands’ finances. Confident in his charm, wit, and good looks, Falstaff attempts to lure the two away from their husbands in order to gain money. However, he is unaware that the women know of his plot and have plans of their own involving revenge and humiliation. Several harmless pranks are carried out at Falstaff’s expense involving a laundry basket and a rather large dress. As the two women entertain themselves, they must dodge several obstacles such as the suspicion of Falstaff and the unnecessary jealousy of their husbands. Mistress Ford’s husband fears for the future of his marriage so much that he visits Falstaff in disguise and hears of the entire plan. Unfortunately, Master Ford only motivates Falstaff to pursue Mistress Ford further, creating new complications for the wives. As all characters struggle to arrive at a happy ending, their unique personality traits and accents come through, captured marvelously by the actors. The costumes and props perfectly fit the time period, and enhance every scene. Class distinctions become obvious through clothing, especially when the voluminous gowns of the wives are placed side by side with Falstaff’s worn shirt, vest, and boots. The settings also undergo a dramatic shifts between each scene, for a series of backgrounds rotate into place, easily changing from the countryside near a large estate to the inside of the Garter Inn, a pub inhabited by peasants. Similar to Shakespeare’s other works, many subplots which revolve around the central theme appear as the story develops. From the beginning, Mistress Page struggles to find a suitable candidate for her daughter, Anne, to wed. As multiple men present themselves, each is more peculiar than the last. The true value of this subplot is the manner in which each suitor embraces his role and gives it a unique personality. One man, a French doctor who is ironically prone to injury, divides his time between pursuing Anne and honing his nonexistent sword fighting skills for revenge on a man who tricked him. The combination of entertaining pranks, abundant secrecy, and seamless choreography results in a stunning production of a Shakespearean comedy. Small touches of modern humor throughout the play are integrated into the script by the Seattle Shakespeare Company so as to enhance the original work. Falstaff’s misfortune becomes a benefit for everyone as the noble wives of Windsor plot to remain merry. 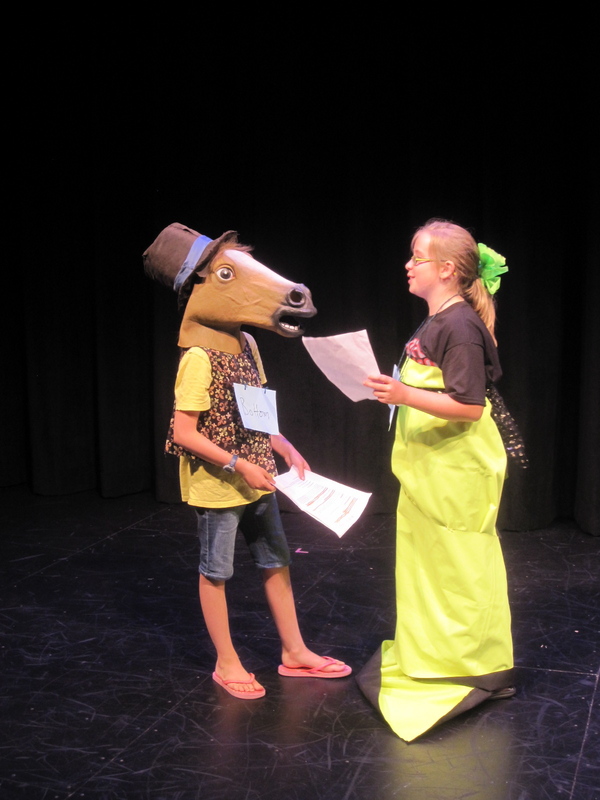 This entry was posted in Events, Opinions, Teen Powered, Tidbits and tagged shakespeare, Theater, theatre, written by teens on May 4, 2011 by Teen Blogger.